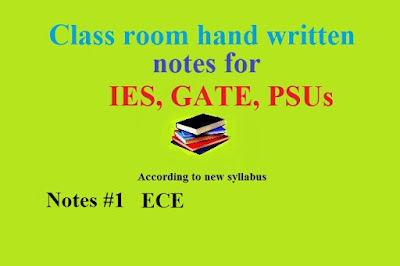 These class room notes are collected from one of the most famous coaching center for engineering examination. Here we are providing class room notes of every subject of ECE which are mainly followed GATE and IES syllabus. These are very good study materials for electronics and communication (ECE) and best study materials for GATE, IES, and others examination. I needed such type of notes very much but now i want a specific GATE book for this exam. Notes are quite good thinh but it will be better if we have some books those only specified for GATE. thanks for the great information, useful for me. Thank u very much for such a wonderful help........This is very beneficial for each & every student. thanks a lot, this website very much help full for us. Thanks alot for putting this notes. It is very useful. Thank You very much for providing such useful notes. Follow the instruction of download process, that mention in bellow of download links. see this video, u can access some tests like offical tests for free . password is just dei@1234.
like it and share it, rest of the test will be uploaded soon depending upon how many people like. very very thanks for uploading made easy notes, thanks a lot,really helps for who can not join made easy. Appreciate work and also notes are easy to understand. Thanks for sharing. Thanks for this... those who try to clear the GATE or IES exam can refer this also you better join in coaching center to reach your goal.